State Congress competitors take the oath of office before starting preliminaries. 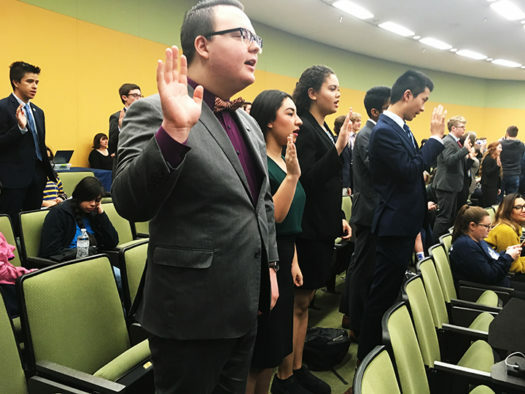 Before school was even back in session after the Christmas holidays, three debate students traveled to Austin to compete in state Congressional debate. Junior Colby Menefee, along with senior Andrea Garcia and Josalyn Taylor, qualified after sweeping the Region VI meet in November. The competitors prepped for state by writing new legislation speeches and filing news articles. One of the weekly tasks for all speech and debate students year-round is filing current events news articles so that debaters have a library of information available when they are prepping for a contest. The state meet is a two-day event that has all competitors debating for two three-and-a-half-hour sessions, one before and one after lunch. The top six debaters in each of the three rooms of 20 then advance to day two. At state competition, Colby Menefee advanced to finals, which were held at the state Capitol. After two finals rounds, he placed eighth overall in 3A competition. Congress is not the only competition that the three students compete in. Menefee and Garcia are debate partners in CX debate, and Taylor competes in LD. All three will compete in Congress again next month at their NSDA district meet, vying for a shot at national competition in June.